Operating theaters were so-called in the United Kingdom because they traditionally consisted of semicircular amphitheaters to allow students to observe the medical procedures. An operation theater (OT) complex is the “heart” of any major surgical hospital. An operating theater, operating room (OR), surgery suite, or a surgery center is a room within a hospital within which surgical and other operations are carried out. The patient is the center point of a functioning OT complex. He/she is in isolation for varying times, away from his near and dear ones and is physically sick. Efforts should be directed to maintain vital functions, prevent infections/promote healing with safety, comfort, and economy. The establishment and working of the OT need specialized planning and execution and is not a simple civil engineering work. A “civil-mechanical-electrical-electronic-biomedical” combo effort driven and coordinated by the needs, preferences, and safety of the medical/surgical team forms the basis for starting and maintaining an OT. Hospital-acquired infection contributes to about 20% of admissions in the developing world. Hospitals should exercise great care in proper maintenance of the OR environment, heating ventilation and air-conditioning system (HVAC) system, and medical and nonmedical equipment inside the OR. Personnel involved in disinfection and sterilization process should follow aseptic protocols. Sterilization means complete eradication of microorganisms from the operating environment. The sources of bacteriological contamination can be from air, water, medical, paramedical staff, patients, and articles brought in to the sterile environment, clothing, instruments, infected body fluids, electronic gadgets, and personal items such as wallets, mobile phones, and jewelry. Aseptic protocols mean following safe and disciplined procedures to minimize or eradicate the microbiological load in the environment and in the instrument brought into the sterile field during the surgery. Disinfection process of the OR and equipment. In the present era of evidence-based medicine, it is imperative to give maximum importance in planning an OT complex. Within the limitation of finance and space, maximum benefit can be obtained by proper planning in the initial stages. The OR should be preferably located where the movements of patients are limited. It is best to avoid an operation room in the ground floor, where maximum traffic of personals is located in most hospitals. The materials used for the construction of the OR needs to be long-lasting, easy to maintain, and resistant to the growth of microorganisms. Disposal zone: All unsterile items from the OR should come out through a separate exit which leads to the disposal area directly. Sterile and unsterile items should not use the same entrance. Proper planning is essential to incorporate the standards as laid down by the local bodies and NABH [Table 1]. The HVAC system consists of the air handling unit (AHU), inflow and outflow ducts, air-conditioning compressor, air blower, pre-HEPA filters (3 and 5 μ filters), and laminar air flow (LAF) plenum with terminal 0.3 μ HEPA filter. The size of the AHU and HEPA filters are in accordance to the volume of air inside the operation room. The number of the pre-HEPA filters in the AHU can be altered depending on the volume and pressure of air that is to enter the Main OR. Approximately, the volume of air entering the OR should be equal to or greater than the volume of air in the OR. It is easier to attain the required air quality standards with less strain on the HVAC system when the AHU and the terminal LAF plenum are placed close to each other, as this would reduce the length of the inflow air ducts. Reduced inflow duct length would translate as less strain on the compressor to produce air cooling and less strain on the air blower to achieve the required air pressure and air changes/hour. All this has to be taken into consideration for planning the OT and zoning. The AHU has three chambers; the first chamber has provision for fresh air inlet and returns air inlet. The air passes through a set of 5 μ filters into the second chamber where it is cooled by the condenser coils and blown by an air blower at a desired pressure through a set of 3 μ filters into the third chamber. The cooled, filtered air now passes through a thermoinsulated aluminum air ducts into the terminal LAF plenum inside the OR, which houses a 0.3 μ filter. The pressure, temperature, and humidity are continuously monitored [Table 2]. The AHU should be operational throughout the clock to maintain the quality of air. To reduce the electrical load consumption, a variable flow device can be installed which regulates the air-exchanges in the OR without the cooling effect. The pre-filters installed in the AHU needs to be cleaned regularly, at 3 monthly intervals and can be reused. The terminal 0.3 μ terminal filter needs to be changed when the required standards of particulate count monitoring are not met or the air qualities are not up to the required standards. In OR with an HVAC system, proper surface disinfection is crucial to maintain an infection-free environment. Disinfection means cleaning an instrument/item to make it completely or partly free of any infection-causing microorganisms. An ideal disinfectant must kill all microorganisms and at the same time not cause any harm to humans. Certainly, no such disinfectant exists. Some of the commonly used disinfectants are given in [Table 3]. Formaldehyde and glutaraldehyde are not recommended for disinfecting ORs as they are carcinogenic in the concentration used to disinfect. Hence, they have a limited role as a disinfectant. However, formaldehyde fumigation can be done initially during a start-up of a theatre or after an overhaul cleaning process. Formaldehyde 6%, glutaraldehyde 6%, and benzalkonium chloride 5% can be used using adequate personal protective devices. For example, for 4000 cft, 325 aldekol in 350 ml of water is sprayed for 30 min. OT must be closed for 2 h.
It is a formaldehyde-free disinfectant cleaner with low use concentration. Ingredients are glutaral 100 mg/g, benzyl-C12-18-alkyldimethylammonium chlorides 60 mg/g, and didecyldimethylammonium chloride 60 mg/g. This provides complete asepsis within 30—60 min. Cleaning with detergent or carbolic acid is not required. Ethanol, 2-propanol, and 1-propanol can be used as spray for surface disinfection and does not act on spores. It is used for instant disinfection. Ultraviolet (UV) irradiation as a form of disinfection is not standardized and not recommended as a routine disinfection technique. However, it is used inside ducting of HVAC system, pass boxes to disinfect the air. With the development of fumigation free theaters and HVAC systems, routine microbiological monitoring is not advised. Unlike in Western countries, no standard exists in India on the frequency of microbiological surveillance. At present in the Indian scenario, microbiological surveillance is done based on the individual knowledge, availability of resources, funds, access to microbiologist/laboratory, amount of surgical load, occurrence of SSI, and the maintenance of air quality inside the OT. Settle plate method (duration of exposure should be equal to the time taken for the shortest surgery). Settle plate should be placed 12 inches above the operating table. Minimum colony-forming unit should be 10 but depends on the bacteria isolated. Cultures incubated at 37° for 48 h. Aerobic and anaerobic bacteria culture media need to be used. In HVAC systems, microbiological monitoring is replaced by particulate count monitoring of 0.3 and 0.5 μ size and other parameters as shown in [Table 5]. The frequency of OT validation depends on the surgical volume. Ideally, it should be done twice a year [Table 5]. Adequate cleaning with a proper disinfectant is important as it removes all dust, bacterial flora, organic matter, and other contaminants. The disinfectant used should noncarcinogenic, easily available, and safe to be used by the hospital staff. Most disinfectant removes almost 90%—95% of the infectious microbes except spores. Keeping the operating complex dry would make microbes and even spores unviable. Only wet mopping of walls and floor should be employed inside the OR complex. Use the three bucket system to mop the OT. The first two buckets contain RP purified water and the third bucket contains the disinfectant diluted with RO water. A clean and dry mop is immersed sequentially into the buckets before the figure of eight methods of cleaning is used. The walls also cleaned with a lint free cloth using the three bucket system taking care to mop from clean to unclean area[Table 6]. Every item that is packed for autoclave must have a date and time. Steam-sterilized items must be used within 48 h. Once the sterile pack is opened, the contents become unsterile even if they are not used. Have a separate storage area for sterile goods. Sterilization is a process in which all microorganisms including bacterial spores are destroyed completely. 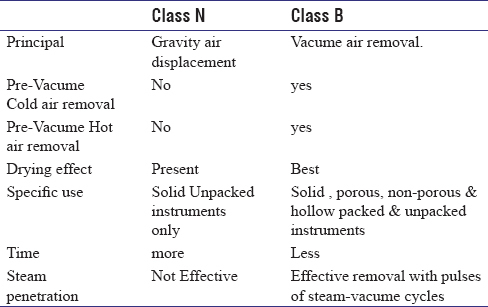 The common methods of sterilization are as follows [Table 7]. Flash autoclaves and glutaraldehyde forms of sterilization are not applicable and safe for ophthalmic instruments. However, if used must be done with caution [Table 8]. Ethylene oxide (ETO) sterilization was first reported in 1859. The sterilization cycle consists of five stages — gas introduction, evacuation with humidification, exposure, evacuation, and air washes, taking about 2 1/2 h. Mechanical aeration takes between 8 and 12 h at +50°C to +60°C, and on completion of aeration, the sterilized objects are removed. ETO Sterilization is suited for objects which cannot sustain the high temperature and moisture necessary for steam such as with autoclave sterilization. Vaporized hydrogen peroxide (VHP) sterilization is made up of three stages — conditioning including vacuum generation, aeration, and H202 injection, taking about 60 min, including aeration time. VHP sterilization is suited for objects that cannot sustain the high temperature and moisture necessary for autoclave sterilization, and its low temperatures— +25° to +50°C make it suited for medical devices which may have electronics. This is the only indicator that confirms the sterility of the autoclaved load. It is also used to validate the sterilization process. This consists of a sealed vial with two chambers. The inner chamber contains the broth and outer chamber has the spores of the most heat-resistant bacteria bacillus thermophillus. For every load, one vial is packed and placed in the most challenging part of the load intended to be sterilized. After the sterilization process, the processed vial and an unprocessed control vial are crushed so that the inner chamber breaks mixing the broth and the spores. These crushed vials are then incubated at 57°C for 48 h in a biological indicator incubator., The vials are inspected and findings documented at 12 h, 18 h, and finally at 48 h.
In a successful sterilization cycle, the processed vial does not change color and remains violet, while the unprocessed vial shows color change from violet to yellow indication growth of bacteria in the vial. The BI should be ideally used in every load of the autoclave cycle. Press the cap firmly into place. Blades shall be removed by an appropriate tool and discarded by the use of a tool. Sharps shall never be left “lying around.” Loose needles shall never be placed or left in the patients' linen. All the water used in the OT complex and Laboratories should be treated in a water chamber, with 5% sodium hypochlorite for 30 min in a ratio of 1:3 (part of 5% sodium hypochlorite for 3 parts of wastewater) before let out into the main sewer. Proper personal protection devices such as gloves, cap, mask, aprons, and shoes should be used by the personals while handling the biomedical waste. Segregation of biomedical waste at source and proper transportation to the site of disposal is important. Laufman H. The Operating Room. In: Benett JV, Brachman PS, editors. Hospital Infections. Boston: Little Brown & Co; 1986. pp 315-24. Rice NS, Harry J. Ophthalmic operating theatre design: Methods of sterilization. Proc R Soc Med 1969; 62:1203-04. Sehulster LM. Chinn RYW, Arduino MJ, Carpenter J, Donlan R, Ashford D, et al Guidelines for environmental refection control in health care facilities. Recommendations from CDC and the Healthcare Infection Control Practices Advisory Committee (HICPAC) November 2003. Senior BW. Examination of water, milk, food and air. In: Collee JG, Duguid JP, Frase AG, Marmion BP, Simmons A, editors. Mackie & McCartney's. Practical Medical Microbiology. New York; Churchill Livingston,1989. p. 204-39. Sharma S, Bansal AK, Gyanchand R. Asepsis in the ophthalmic operating room. Indian J Ophthalmol 1996;44:173-77. Recommended practices for the care and cleaning of surgical instruments and powered equipment. AORN Journal 1997;6:124-28. Recommended Practices for Sterilization in Perioperative Practise settings. Associations of Perioperative Registered Nurses. AORN Standards, Recommended Practises and Guidelines.2008. Reichert, Marimargaret and Young, Jack, Sterilization Technology for the Health Care Facility. Aspen Publication, Gaithersburg, Maryland, 1997:129-49. Association for the Advancement of Medical Instrumentation. Comprehensive guide to steam sterilization And sterility assurance in health care facilities. ANSI/AAMI ST79:2017. Vesley D, Langholz AC, Rohlfing SR, Foltz WE. Fluorimetric detection of a bacillus stearothermophilus spore bound enzyme, a D-glucosidase for rapid identification of flash sterilisation failure. Appl. Environ. Microbial 1992;58:717-9. Rutala WA, Gergen MF, WeberDJ, Evaluation of a rapid readout biological indicator for flash sterilisation with three biological indicators and three chemical indicators. Infect. Control Hosp. Epidemiol 1993;14:390-4.